Grocery retailers across the United States have vastly improved on providing sustainable seafood, according to the 10th edition of Greenpeace’s Carting Away the Oceans report — while failing to take significant action on the growing problem of single-use plastics. 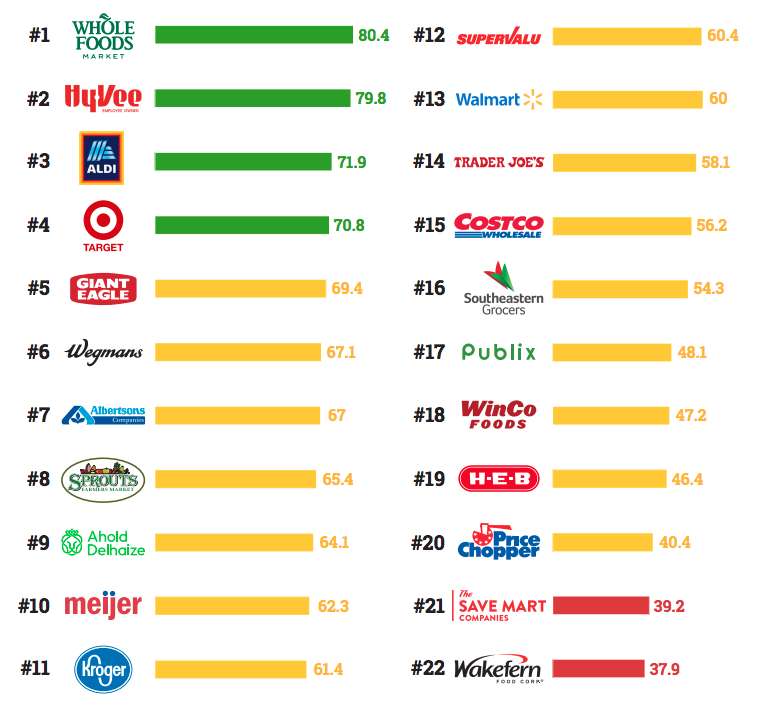 Whole Foods remains the top-ranked retailer this year, following the implementation of a strong shelf-stable tuna policy and marked sourcing improvements. Hy-Vee placed second, achieving high marks for its advocacy and transparency initiatives. ALDI moved into the top three for the first time ever, buoyed by new policies to address problem practices like transshipment at sea, which is linked to illegal fishing and human rights abuses. Target moved into the top four following improvements in policy and advocacy initiatives, though the company broke a 2010 commitment by reintroducing farmed salmon in its stores. On the other end of the spectrum, Price Chopper, Save Mart and Wakefern scored the lowest in this year’s report. Trader Joe’s dropped the furthest for its lack of initiatives or customer engagement on sustainable seafood. More than eight years after Trader Joe’s committed to improve on seafood sustainability, the retailer does not have a robust, public sustainable seafood procurement policy, according to Greenpeace. None of the retailers profiled have comprehensive policies to reduce and ultimately phase out their reliance on single-use plastics, said Greenpeace. “The equivalent of a garbage truck of plastic enters our oceans every minute,” the report said, “and with plastic production set to double in the next 20 years — largely for packaging—the threats to ocean biodiversity and seafood supply chains are increasing.” Greenpeace is urging retailers to take responsibility for their contribution to this pollution crisis, as cities nationwide and large foodservice companies are already making commitments to start phasing out single-use plastics.